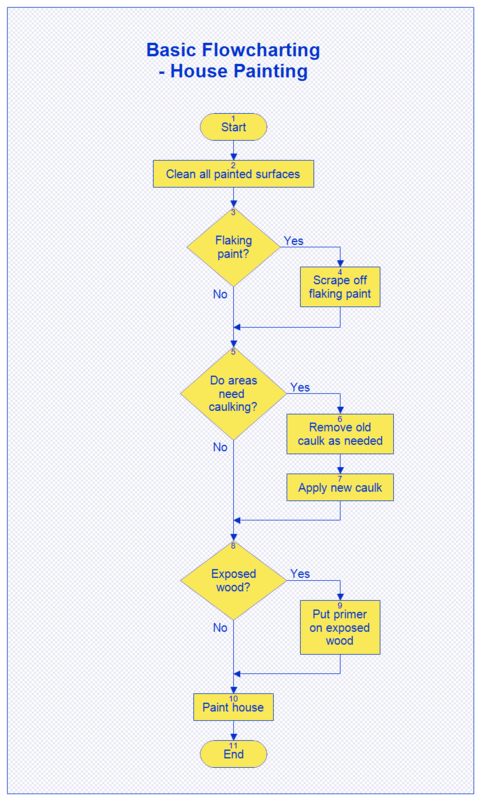 Description This flowchart shows the basic steps needed in painting a house. Each flowchart has one starting point and one or more ending points that are drawn with a rounded rectangle or oval. Steps, actions, or tasks are drawn with rectangles. It helps to use verbs in describing the steps. Decisions are drawn with diamonds with labels at the exits. The arrows show the order the steps are taken. The shapes in a flowchart are often numbered to make it easier to refer to them. RFFlow allows you to automatically number shapes. Click on Tools, Number Shapes. Once RFFlow is installed, you can open the above chart in RFFlow by clicking on basic_flowchart_house_painting.flo. From there you can zoom in, edit, and print this sample chart. It is often easier to modify an existing chart than to draw it from scratch. To draw this chart without downloading it, run RFFlow and use the shapes in the Sample Stencil. You can right-click on a shape in a stencil and change it's properties. For this flowchart, you would make the rectangle and terminal shape filled with a solid yellow color. The background is just a large rectangle filled with a hatch pattern.